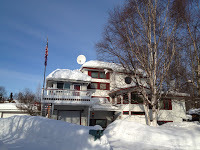 During Anchorage Alaska’s long summers our Camai Bed and Breakfast guests often ask what the winters are like. The accompanying winter picture of Camai B&B tells much of the story. This winter has been filled with a unusual amount of snow for Anchorage. We are now just 6” away from a record snowfall year. Since we still have at least a month of winter left, we may break the record. Does the snow slow us down? Not really. Which at times is unfortunate for some who lose control of their vehicles. I think everyone in Anchorage tries to leave a little early for appointments and events, but sometimes cannot. 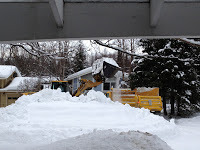 In January 2012 the major’s office posted a blog on the history of snow removal within the municipality. Recently there have numerous letters to the editor which are mostly complaining about the poor snow removal. It is an election year. More than one Anchorage voter has commented on how the mayorial elections can be lost due to poor handling of snow removal. With this year’s snowfall the mayor’s office has set up a website just for the snow removal status. The main roads are plowed regularly. For the most part our residential roads are plowed. The city has big snow blowers which come through and reclaim the streets by blowing the snow into resident’s front yards. It is amazing that the street really is wide enough for two cars to pass one another. Camai B&B is located on a cul-de-sac. When snow plows come they plow in every tighter circles until they have made a mound in the center. The center mound has to be hauled away to a city snow dump. The video posted on Camai Bed and Breakfast’s Facebook page shows the large skip loader filling a damp truck. There was so much snow that it filled eight dump trucks.